When a child hurts himself and starts to cry, there are numerous ways his parents might react: alarm, fear, laughter. It may not be the proudest moment of parenthood, but if you have never been inspired to uncontrollable laughter by your child’s mishaps, then you haven’t been a parent very long or your pants are on fire. If there is no blood, try to conduct yourself in a manner that appears sympathetic. The first responsibility is easy to fulfill. The second, not so much. It depends upon the circumstances. Sometimes children hurt themselves in mundane ways that are not at all hilarious. It’s easy to be a good parent when you’re bored. But when the kid goes slapstick, be prepared to have your parenting chops tested. Last week, my preschool son found a spider on the kitchen floor. As the self-appointed neighborhood watch chief, when it comes to tiny pests in the house, he immediately contacted the authorities. I (the authorities) relocated the spider outdoors. My son, harkening to the classic axiom of infestations: where there is one, there are bound to be others, decided that he’d better check the kitchen for other spiders. He got my flashlight and was soon crawling around inspecting the nooks and crannies of the room. We have an island in the middle of our kitchen. My wife and I were standing on one end, and my son quickly disappeared from view as he crawled around the other. We could hear him rooting about on the floor as he entered an area populated by a few wooden chairs. 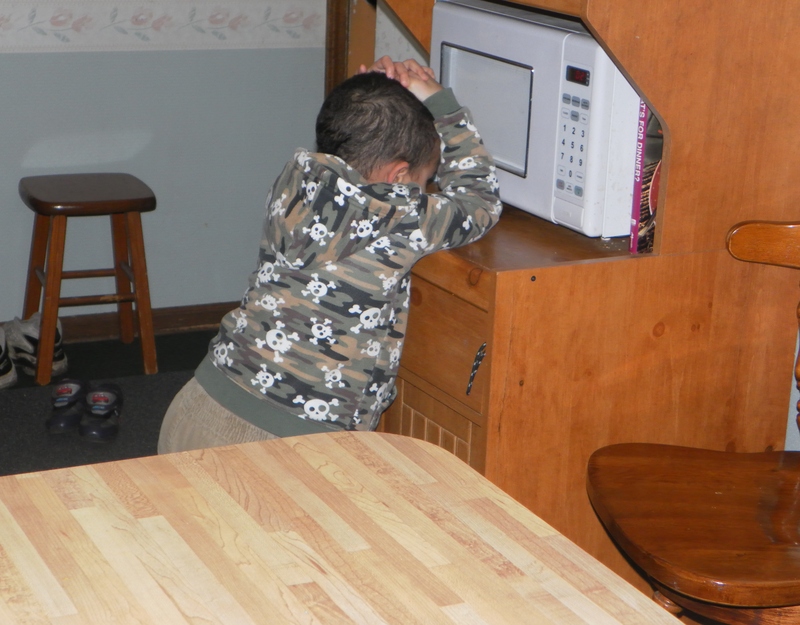 In this over-acted dramatization of the recent tragedy, the boy makes an editorial comment by turning to the microwave for the sympathy that more fortunate children expect from their parents. He stood up, both hands holding the top of his head as if pressing that fixture firmly down on his neck until the glue dried. Tears ran down his cheeks as he looked to us for the sympathy so common to our parental natures. There was no blood, so we looked away, a moment before our bodies began to shake with laughter. We couldn’t look at him; we certainly couldn’t look at each other. We hid our faces. “I . . . bumped . . . my . . . head,” he choked out, almost audibly. I put my head down on the counter and covered my eyes. All I could think about were the spiders who were taking advantage of this tragedy to make good their escape. I can’t hide my mirth on such a regular basis. Once the blood check was over, I let it out. He was angry at first, but after I sat down with him and gave him a big hug, his crying subsided. “Why are you laughing?” he asked. “Yeah.” He started to laugh too. They say it’s the best medicine. This entry was posted in Parenting Issues (i.e. Mistakes) and tagged children, family, fatherhood, humor, kids, parenting, Sons. Been there, done that! Another great post, Scott! But I’m sure you did it more gracefully. Sometimes kids cry when they aren’t really hurt that bad, I find that laughing at their mishap at that point can make them think their little accident is funny not sad. Crying will always try to fill the emotional vacuum, if you let it.